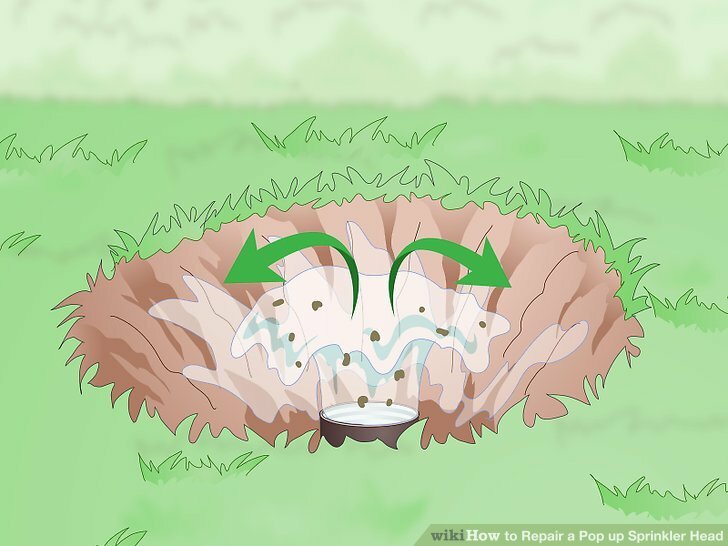 As pop-up sprinkler systems age, it’s possible for the heads to chip, break, or become stuck in the up position, resulting in dead, swampy grass and exorbitant utility bills. If you run into one of these issues, the simplest solution is to replace the worn out head with a brand new one. Dig up the grass around the sprinkler just enough to expose the fitting and unscrew the faulty head. Then, screw the new head on in its place and turn on the water to the sprinklers to give them a quick test run. 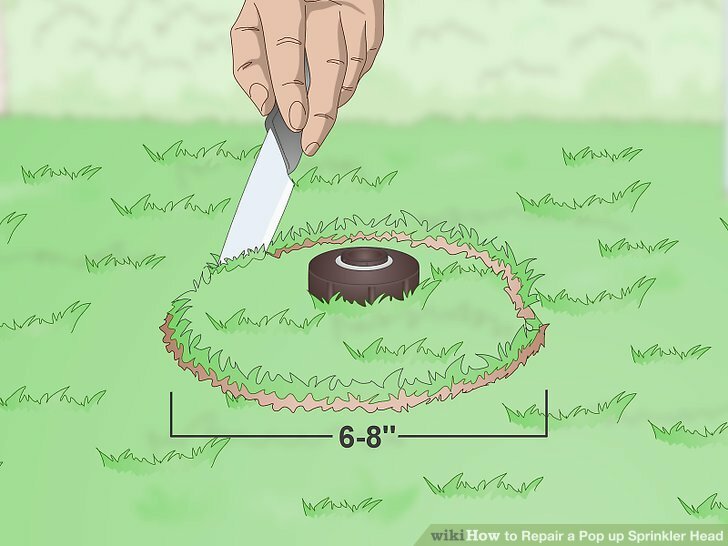 Cut a circle into the grass around the faulty sprinkler. Take a serrated knife or trowel and saw a wide circle around the exposed sprinkler head. You just want to score the turf to make it easier to remove later, so only cut deep. Be careful not to cut too deep, or you could accidentally sever the tubing running to the inlet on your sprinkler system. If the ground around your sprinkler is an especially loose material, such as gravel or mulch, skip the scoring and go straight to digging out the soil. 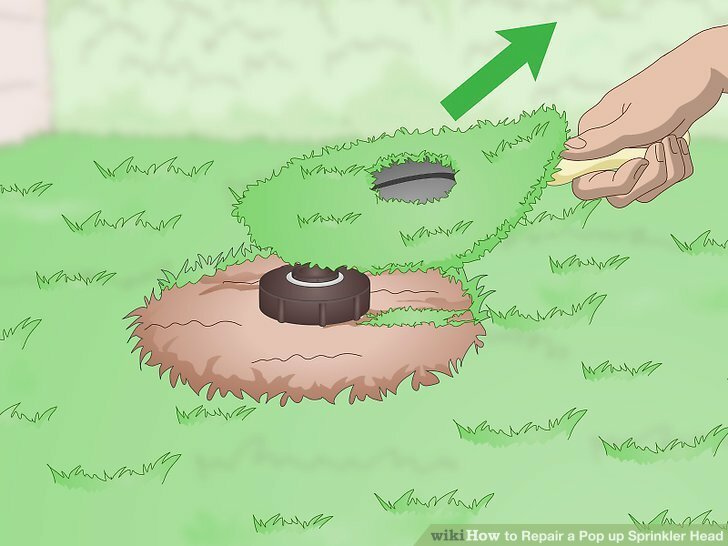 Remove the intact grass around the sprinkler using a hand trowel. Do your best to carefully pry up turf in as few pieces as possible. Once you’ve worked it loose, set the turf aside somewhere nearby. That way, you’ll be able to replace the section later after you’ve changed out the sprinkler head. Don’t worry if you happen to damage the turf while trying to lift it out. It’s a small enough patch that the grass should grow back fairly quickly. Dig into the dirt surrounding the sprinkler head. Now that the turf is out of the way, use your trowel or shovel to scoop out the soil along the sides of the hole. Keep digging until you can see the thin metal supply pipe connecting the sprinkler head to the main water line. 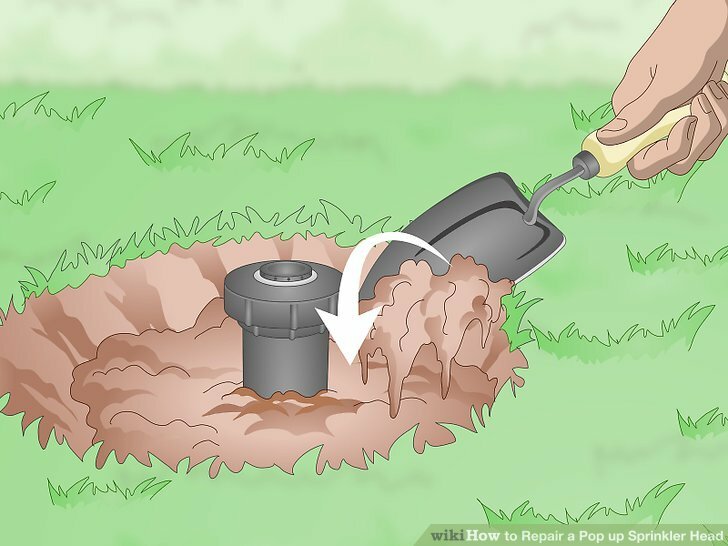 As you dig, heap the dirt into a small pile nearby so you can easily fill in the hole when you’re done. 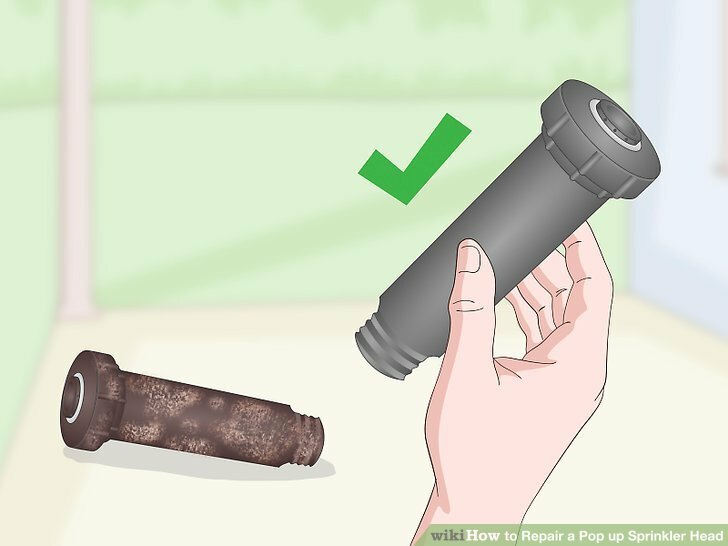 Perform a quick inspection of the supply pipe to check for damage. If you see a leak or rupture, the problem may be with the water line rather than the sprinkler, in which case you’ll need to hire a plumber to come in and take a look. Unscrew the faulty sprinkler head from the riser. The riser is the small pipe that connects the sprinkler to the water line. The sprinkler head sits on the riser, which helps to regulate its up-and-down movement, rather than directly on the water line itself. To remove the sprinkler head, twist it to the left, or counterclockwise. If the riser comes off with the sprinkler head, simply unscrew the two pieces and reattach the riser to the water line, being careful not to damage the threading of either piece in the process. Be careful not to let too much dirt or debris fall into the open water line. It may help to cover it with a small cloth or plastic bag while you’re working. Buy a replacement sprinkler head that’s the same size as the old one. To ensure that you’re getting the type of head you need, take the old part to the store with you and purchase the same brand and model. If for some reason that’s not an option, confirm that the new head has the same overall length and diameter as the old one. Sprinkler heads come in several different sizes and lengths. If you get one that’s too long, it will stick up high out of the grass after you install it. If it’s too short, it may not reach the surface of your lawn from its seat on the water line. Consider shopping around for a head that features a removable flush cap rather than a traditional nozzle. Flush caps make it easy to clear dirt from the head following installation or use. Wrap a length of thread seal tape around the male end of the riser. Wind the tape neatly around the riser threads so that it forms a thin, uniform layer. Applying thread seal tape (also known as “Teflon tape”) will fill excess space between the riser and the body of the sprinkler head, creating a snug connection and decreasing the chances of future leaks. You can find thread seal tape in the plumbing aisle of any hardware store or home improvement center. It’s not necessary to use thread seal tape on polyethylene risers, as the soft plastic will typically bend and expand enough to form a secure seal on its own. Screw on the new sprinkler head. Position the female end of the sprinkler head over the male end of the riser and twist it to the right (clockwise) to install it. Continue tightening the head by hand until it’s nice and secure. Jiggle your new sprinkler head a few times to make sure it isn’t loose. Any extra movement could be a sign of a poor connection. Adjust the sprinkler nozzle to direct the spray pattern where you want it. 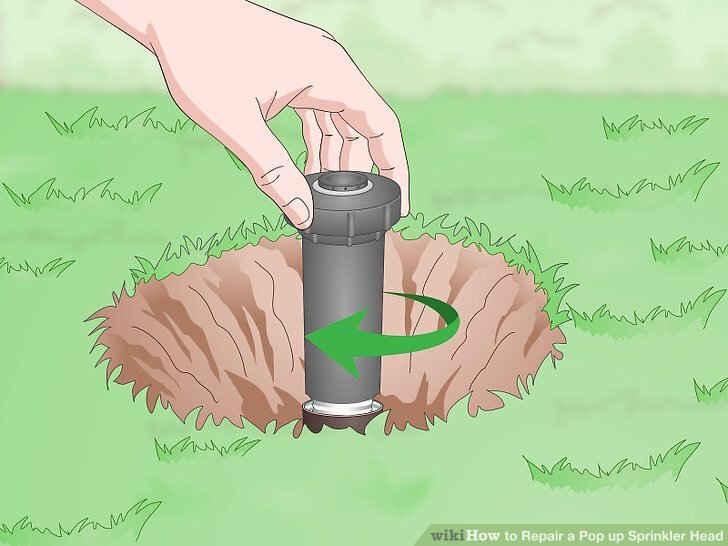 Rotate the sprinkler head until it’s pointing toward your lawn, shrubs, of flower beds. The last thing you want is for your newly-installed sprinkler to water your car instead of your plants! There should be no need to adjust a radial sprinkler head. These send out water in a full 360-degree radius, ensuring even distribution over the area they’re situated in. Turn on the sprinklers briefly to test them and remove dirt from the line. Let the sprinklers run for 30 seconds to a minute to make sure all small particles of dirt and debris have been flushed out. Then, shut them off as you prepare to fill in the hole you dug. After a quick test, they’ll be ready to run on their regular cycle. While your sprinklers are running, keep an eye out for leaks around the riser. If you see water escaping, tighten the sprinkler head or add an extra layer of thread seal tape until the leak stops. It’s a good idea to test your new sprinkler head before backfilling the hole in case something goes wrong and you need to reinstall it. Flush the open water line to clear out major clogs. If your water line is stopped up with dirt, you may need to flush it out more thoroughly. 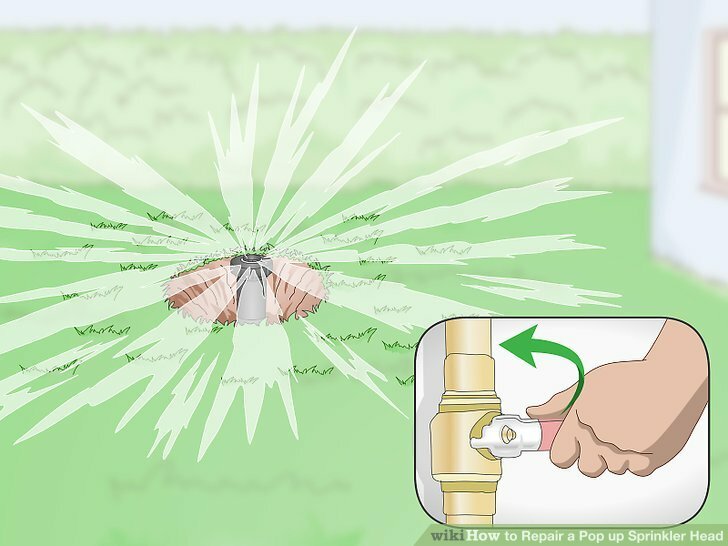 Remove the new sprinkler head and turn on the water to the sprinkler for 30-60 seconds to let the debris-filled water drain out of the open line. Don't forget to turn the water off when you're done. 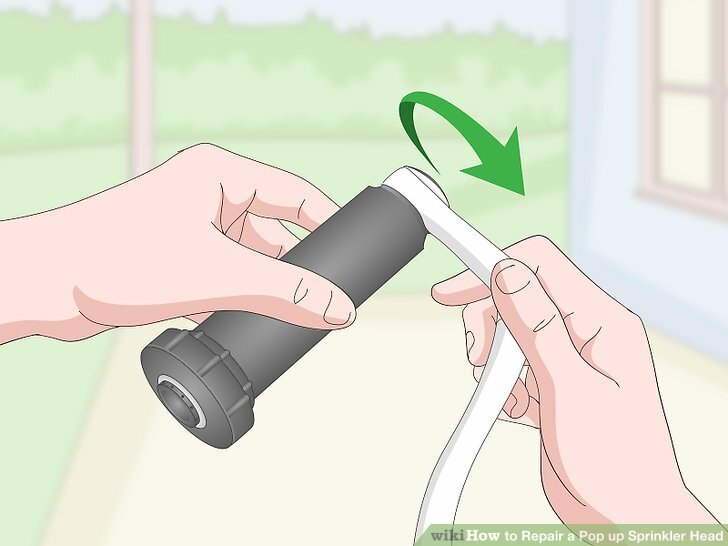 You can also fit a flexible hose or section of PVC pipe over the water line while flushing it out to redirect the water to another part of your yard. In some cases, a clogged water line may be the actual cause of a malfunctioning sprinkler rather than a broken head. Fill in the hole around the sprinkler. Shovel the dirt back into the opening around the water line, making sure it’s distributed evenly around the base. 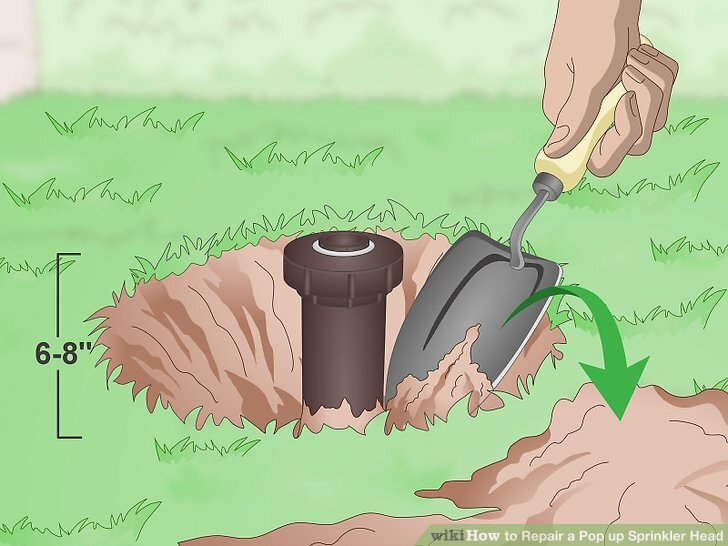 Once you’ve returned all the loose soil to the hole, tamp it down flat around the new sprinkler head using your palm or the back of your shovel or trowel. Since the new sprinkler is the same size as the old one, you shouldn’t have any extra dirt left over. 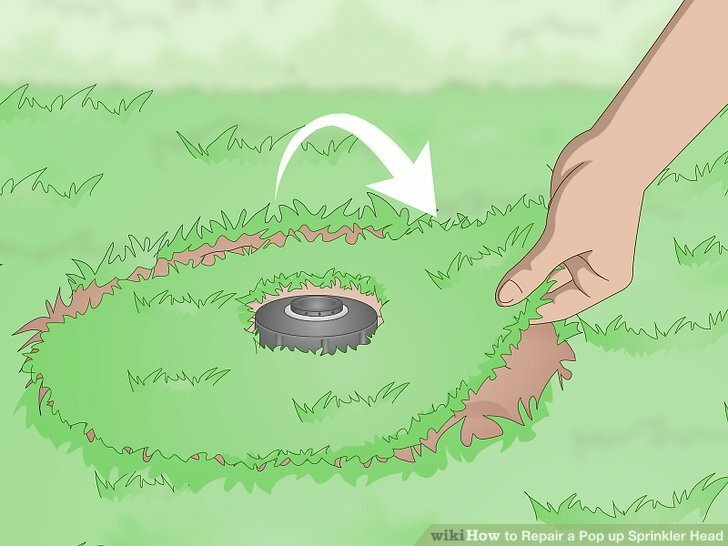 Replace the loose section of turf you cut earlier. 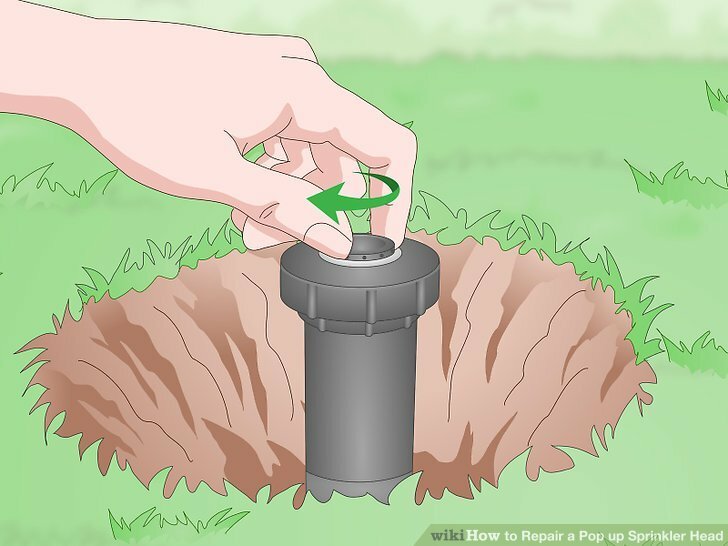 If you managed to remove the grass in one piece, lower it into place around the new sprinkler head. 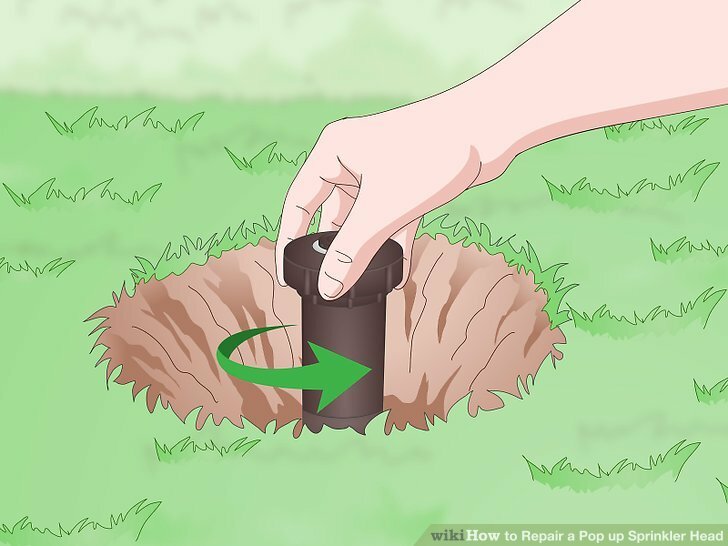 Apply pressure to the turf by stepping on it or pressing the back of your shovel against it to compact it down. Water the transplanted section of turf right away to help it reestablish its root system. Tread lightly around your sprinkler for the next 1-2 weeks to avoid harming the grass while it grows back. You can often buy replacement pop-up sprinkler heads for as little as $10-20. Put on an old change of clothes before you start tinkering with your sprinkler. Since you’ll be working directly on your yard’s water line, things may get a little muddy. Damaged grass should grow back within a few weeks. Afterwards, it will be like it never happened! If you continue to have trouble with your sprinkler system, it could be that there’s an issue with the water line itself. Contact a qualified outdoor plumber to diagnose the source of the problem and make any necessary repairs.